The last season of Strictly Come Dancing was missing a little something - two little somethings actually, in the form of dancers Flavia Cacace and Vincent Simone. The popular pair may have called it a day on the BBC1 show, but their energies have been put to good use creating this fun, dance-crime caper. 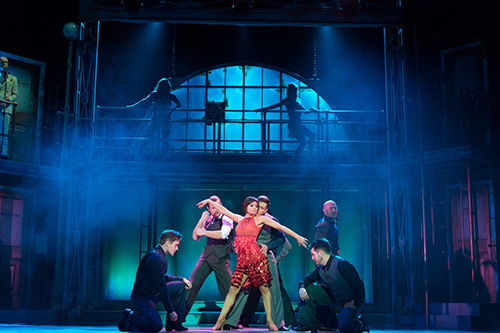 Dance 'Til Dawn is Hollywood noir meets Fred and Ginger with tongue firmly in cheek. There's plenty of laughs, songs, dazzling costumes, and, of course, dance. Vincent and Flavia's last theatre outing, Midnight Tango, was a straightforward dance affair with only one set, a Latin bar. This show improves on that by adding much more of a storyline, a constant change of scenery and a fine medley of support actors and singers to accompany the pair's wonderful dance routines. It feels like a more glamorous show with a bigger budget. It is set in the golden age of Hollywood with a humorous narration from private detective Tommy Dubrowski in the style of Raymond Chandler. It's a good idea using a narrator as Flavia and Vincent never have to try and act out the scenes, but focus on dancing them instead. Tommy quickly gets caught up in the murder of a silver-screen actor, who is the boyfriend of actress Sadie Strauss (Flavia). After witnessing the killing, Sadie ends up on the run with aspiring actor Tony Deluca (Vincent), who is secretly in love with her. Meanwhile, nightclub singer Lana Clemenza - a blonde bombshell who has a gaggle of gangsters at her beck and call - is out to frame Tony for the murder. Helping to recreate the decadent era are live singers, including fabulous Abbie Osman as Lana, performing classic Nina Simone and Frank Sinatra songs and more on 1930s-style microphones. 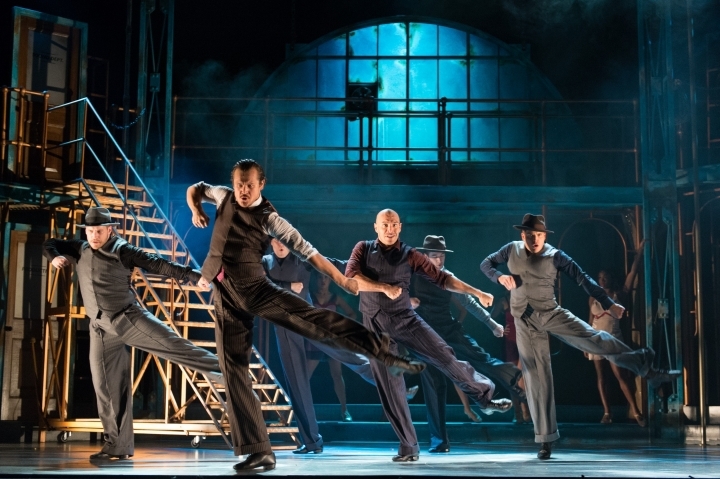 There's also a troupe of energetic support dancers, dressed as chorus girls, gangsters and policemen, whose sprightly choreography adds to the thrills. Although, none of it compares to the moments when Flavia and Vincent take to the floor. Their moves seem so effortless despite the intrinsic difficulty in the steps, be it the tango, American Smooth, rumba or Charleston. There's a particularly clever dance between the two while they are handcuffed, while Flavia's solo routine to Nina Simone's Feeling Good is so good it that you can't help feeing that tingle of excitement at seeing what Len Goodman would call a perfect 10. But before you start thinking Flavia doesn't need cheeky Vincent, the pair team up for a breathtaking Argentinian Tango finale that blows everything else you have seen during the show out of the water. It also makes you realise just what Strictly Come Dancing is missing. Teddy Kempner and Abbie Osman add a wonderful air of comedy to accompany the dancing. Flavia and Vincent are the stars of the show, but Teddy Kempner as Tommy and Abbie Osmon as Lana are perfect comedy sidelines to the pair who steal the limelight outside of the dance routines and keep everyone chuckling through over one and a half hours. It makes this production a well-balanced, entertaining, dancefloor thriller. Tickets cost from £17.90 from the ATG Theatre Website. Southampton Mayflower Theatre - July 1 - 6. Box Office 02380 711811. Phone: Birmingham - 0844 871 3011. Other box office numbers during tour. Great review. I also missed Vincent and Flavia in Strictly last year. And now poor Brucie is gone too. Also seems likely that Anton won't be dancing. Each year, we lose someone.